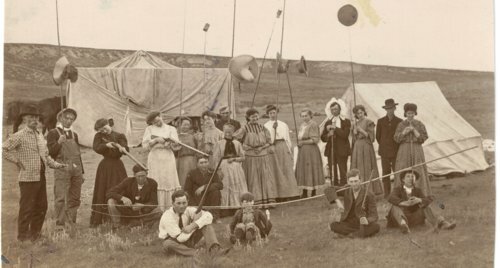 This is a photograph, possibly showing a church group, camping near Grainfield, Kansas. Several of the people have guns and there are tents in the behind the people. Thomas Bishop Albin is back row far left; Otto Albin, front left seated on ground wearing a white shirt; Jim Albin, seventh from left; Flora Albin, sixth from left; and either Ed or Fred Albin right front seated on ground.